The man spent seven hours at sea and has been taken to University Hospital Limerick for examination. A WINDSURFER WHO was reported missing off Co Kerry yesterday afternoon has come ashore in Co Clare. A major land, air and sea search got underway after the windsurfer, who was last seen around 4pm off Ballybunion, failed to return to shore. The alarm was raised at around 5pm and a major multi-agency operation was launched. The Shannon-based search and rescue helicopter, Rescue 115, was tasked to the scene along with the Ballybunion unit of the Irish Coast Guard and Kilrush RNLI. The Fenit RNLI lifeboat was also sent to the area while the Irish Naval vessel LÉ Niamh, which was in the area at the time, was also requested to assist in the search. 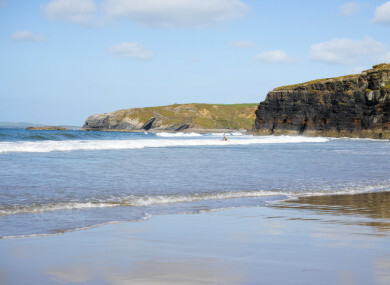 The windsurfer came ashore in Co Clare yesterday evening after seven hours at sea and has been taken to University Hospital Limerick for examination. The man managed to travel 25 nautical miles from Ballybunion in County Kerry to Kilkee in County Clare. Speaking this morning, Charlie Glynn of Kilrush RNLI, said that the man “had to have been an experienced windsurfer who was wearing the correct clothing and gear and who knew what to do when he got into difficulty. He stayed with his board and managed somehow to travel the long distance to shore. Speaking on RTÉ’s News At One this afternoon, Glynn said it was “absolutely amazing” that the windsurfer made it to Kilkee, Co Clare “relatively unharmed, obviously exhausted from the ordeal. But it’s really a testament to his determination to get that far. With reporting by Cónal Thomas. Email “Windsurfer who went missing off Kerry travelled 25 miles before making it ashore”. Feedback on “Windsurfer who went missing off Kerry travelled 25 miles before making it ashore”.